WASHINGTON (AP) — The Federal Reserve raised its key interest rate Wednesday for the fourth time this year to reflect the U.S. economy’s continued strength but signaled that it expects to slow its rate hikes next year. Despite the forecast for fewer hikes, investors sent stocks plunging once Chairman Jerome Powell began a news conference, apparently disappointed that Powell didn’t go further to signal a slowdown in rate increases. Wednesday’s quarter-point increase, to a range of 2.25 percent to 2.5 percent, lifted the Fed’s benchmark rate to its highest point since 2008. It will mean higher borrowing costs for many consumers and businesses. The Fed’s move came despite President Donald Trump’s attacks in recent weeks on its rate hikes and on Powell personally. The president has complained that the moves are threatening the economy. At a news conference after the Fed’s announcement, Powell said Trump’s tweets and statements would have no bearing on the central bank’s policymaking. “Nothing will deter us from doing what we think is the right thing to do,” Powell said. The statement the Fed issued Wednesday after its latest policy meeting said that only “some” further gradual rate increases are likely; previously, it spoke simply of “further gradual increases.” And its new forecast projects two rate hikes next year, down from three the Fed had predicted in September. U.S. stocks had been up sharply before the Fed’s announcement, but the Dow Jones Industrial Average closed down about 352 points. Bond prices surged, though, sending yields lower. “Much of that (Fed) flexibility was lost in translation for financial markets because the fed remains optimistic about growth,” Swonk said. The fear is that optimism could translate into more rate hikes in the future. Powell acknowledged the shift in the Fed’s strategy. “We’re going to be letting incoming data inform our thinking about the appropriate path” of future rate increases, he said. In recent years, the Fed has managed to telegraph its actions weeks in advance to prepare the financial markets for any shift. But now, the risks of a surprise could rise. Next year, Powell will begin holding a news conference after each of the Fed’s eight meetings each year, rather than only quarterly. This will allow him to explain any abrupt policy changes. But it also raises the risk that the Fed will jolt the markets by catching them off guard. Some analysts say the Fed might want to pause in its credit-tightening to assess how the economy fares in the coming months in light of the headwinds it faces. Contributing to this perception is Powell’s view that rates appear to be just below the level the Fed calls “neutral,” where they’re thought to neither stimulate growth nor impede it. 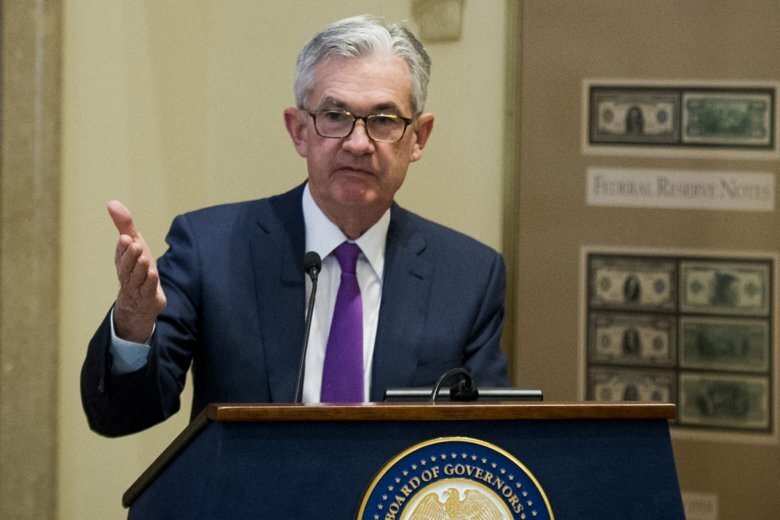 Asked at his news conference whether the Fed’s key rate is near neutral, the chairman said he thinks it’s at the “lower end” of a neutral range. The Fed’s new forecasts also reduce the long-run level for its benchmark rate to 2.8 percent from 3 percent. In doing so, the Fed is signaling that it doesn’t need to tighten credit much further to keep the economy from overheating. Its statement described the economy as strong. But it did note potential threats by adding language to say it would monitor global developments and assess their impact on the economy. In its updated outlook, the Fed lowered its forecast for growth next year to 2.3 percent from the 2.5 percent it foresaw three months ago. It predicts 2 percent growth in 2020. Those estimates are far below the Trump administration’s insistence that its tax cuts would help accelerate annual growth to 3 percent in coming years. Given the still-healthy U.S. economy, the Fed would normally keep gradually raising rates to make sure growth didn’t overheat and ignite inflation. But this time, the risks to the economy seem to be rising. From China to Europe, major economies are weakening. Trump’s trade conflict with Beijing could, over time, undermine the world’s two largest economies.